Thankfully found your site from a blogger while planning a trip to Iceland. Figured we’d see where all you have been and if you had been to Oregon. 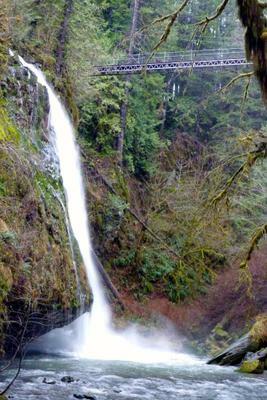 We live in Lincoln City, Oregon and note that Drift Creek Falls (a hike at the edge of town) was not seen on your Oregon Coast Falls page. Perhaps, if and when you return to Oregon, you can see Drift Creek. It is a short hike inland and you get to cross a rope bridge to get to it. We are amazed at your website and where all you have been. LOVE your Iceland page and am using in our planning. We too love waterfalls, but haven’t seen nearly as many as you. Note I need add some to your South America page in Chile, Argentina and South Africa that we saw as well. If you are interested, please visit our website w/ blog of our travels (posted below). The waterfalls in Chile, Argentina and South Africa are on the blog for that trip.